Mendokusaii is one of the best new Apex Legends players on the scene, and he shows us exactly how to treat other teammates. Please learn from him. Lucas Håkansson is a professional Swedish player known by his gamer name Mendokusaii. He currently produces content for the esports organization “Houston Outlaws”. For those who haven’t heard of Mendokusaii before, he’s primarily known in the game Overwatch, where he’s competed in many esports tournaments. He’s had quite a successful showing playing with his past team Cloud9, where he won many titles in minor tournaments. 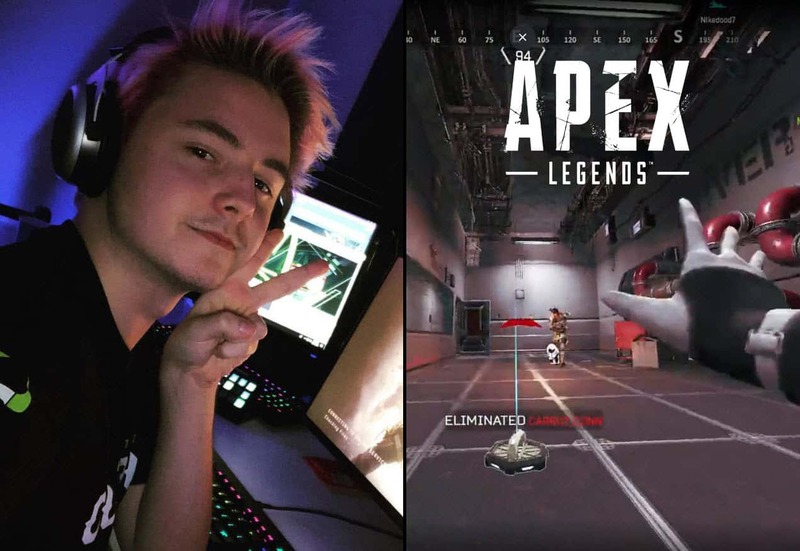 Now dubbed The new kid on the block in Apex Legends, Mendokusaii is providing to be quite the streamer. Utilizing his skills in Apex Legends now, he shows gamers how to play the game by giving advice, and adding his technical opinion on certain aspects of the game. Not many streamers give technical analysis during their streams, and this is what Lucas is bringing to the table that’s fresh. He’s considered one of the smartest players when it comes to Apex Legends, and he’s quickly building a solid list of followers who appreciate his hardwork and insight in the game. On top of Lucas being a great Apex Legends player, he also has a side of him which is rarely seen in the video game world. As gamers, we know how harsh other players can be when you make a hicup, or don’t perform to the best of your ability. You’ll hear occasion trash talking from teammates if their not happy with your decision. Most of the time, it’s teammates who under-performed and are looking for someone to blame. Even if that’s the case, there’s no room for disrespecting other teammates. Some might argue that it’s in the heat of the moment, and it’s normal to feel heated when they are eliminated or loss a game. That’s where Mendokusaii comes in. He shows us exactly how you should treat teammates, especially in a situation when everything was lying on them. In the clip above, Mendokusaii was playing with a friend named mewnfare. The other teammate named Nikedood7 was an outsider, but, still their paired teammate. As the squad landed near Bunker, Mendokusaii’s party friend got eliminated, and Mendokusaii was shot down by the enemy. The last teammate, Nikedoo7, came in with no weapon and low life trying to melee the enemy. However, he failed and the team was eliminated. Typically, gamers would be enraged that their teammates wasn’t able to get the kill and keep them alive. Insults might be thrown back and forth and both players would leave with a bitter taste in their mouth. Well, that wasn’t the case here, and this is something many competitive gamers need to take note of. Instead of calling out Nikedood7, Mendokusaii simply said “nice try man“, and left the game. When both Mendokusaii and mewnfare exited the game and went back into the lobby, mewnfare pointed out Mendokusaii’s kind behavior. He specifically said “when one of our pubs plays really bad, you always tell them nice try“. Gamers aren’t use to hearing “nice things” after a loss. Typically, it’s the name calling and insults that gamers are use to. The so-called “trash talking” afterwards when gamers are negative and try to put the blame on someone else. It’s important to remember that everyone on your team is trying their best, and playing to win. The will be times where you team up with players who have negative intentions, but that’s rare. This is why more players should have the attitude that Mendokusaii brings to the game. Stay positive and always be respectful of your teammates.